Market Forces is about “using your money as a force for good”. 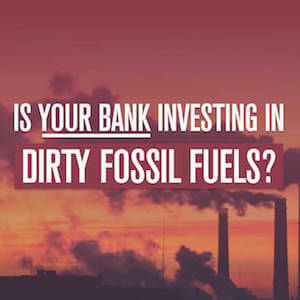 We are running a home loans campaign because home loan customers are some of the most powerful people in the fossil fuel divestment movement because the big banks make so much money from the interest paid on loans. We would like to show the big banks that collectively we can cancel out their profits from dirty fossil fuel projects by shifting home loans. This page outlines the methodology we have used to estimate the profit for each fossil fuel loan and the number of homes that need to be moved. The profit a bank makes on a loan consists of the interest (i.e. net interest margin) charged over the life of the loan plus any arrangement and establishment fees charged. When the net interest margin is unavailable we have used the net interest margin stated in the bank’s most recent half yearly profit announcement. The arrangement fee is one percent of the total loan value equally split between all mandated lead arrangers. The establishment fee is one percent of an individuals bank’s loan amount. Where currency conversions have needed to be made the exchange rate on the day of financial close has been used. We have estimated the amount of home in the following manner. From our Banks on Notice database we have calculated an average home loan size. We have then estimated the amount interest paid over the life of the loan. To do this we have then assumed that the average home loan will be paid off over 20 years at the standard variable interest rate charged by the bank. The amount of home loans required to cancel out a loan is calculated by dividing the estimated profit a bank will make from a fossil fuel loan by the total interest they will earn from a single average loan. As more home loan customers sign up to the campaign the calculations will be updated and the the number of home loans required will be adjusted accordingly.